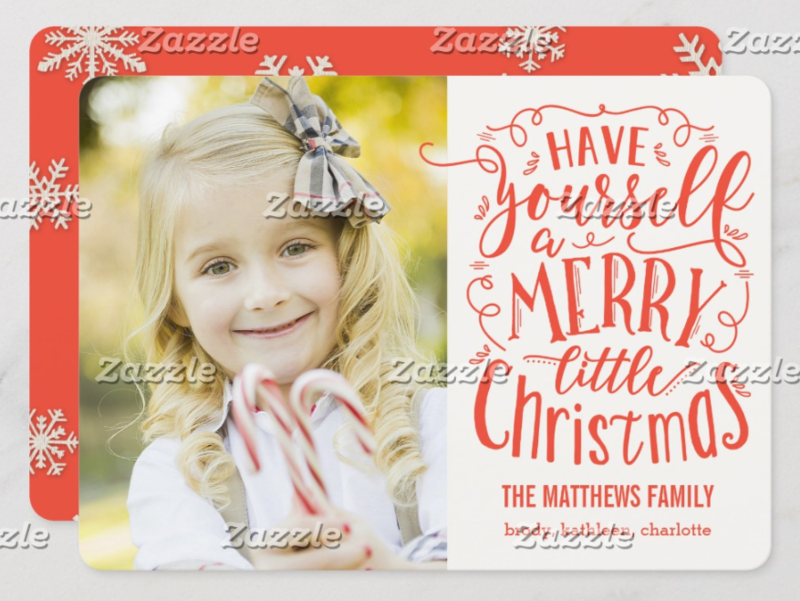 If you’re looking for a customizable Christmas card, here are 12 possibilities. This cute postcard has a vintage look. A good choice if you’re looking for something a bit out of the ordinary. 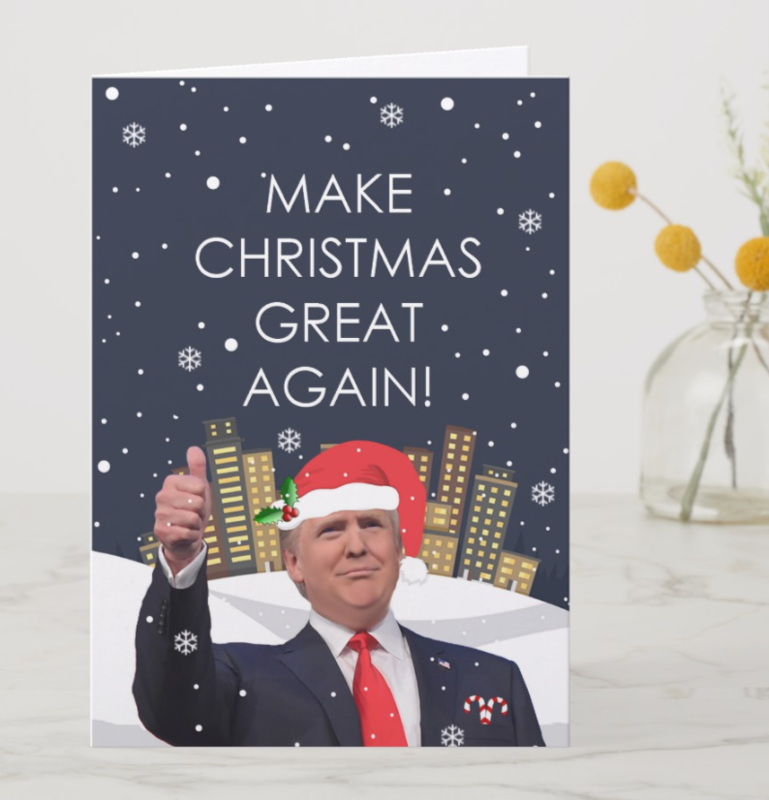 This card is for all the Trump supporters. You might want to be careful who you send this to: some people will not appreciate it, and others will break out in a big grin. 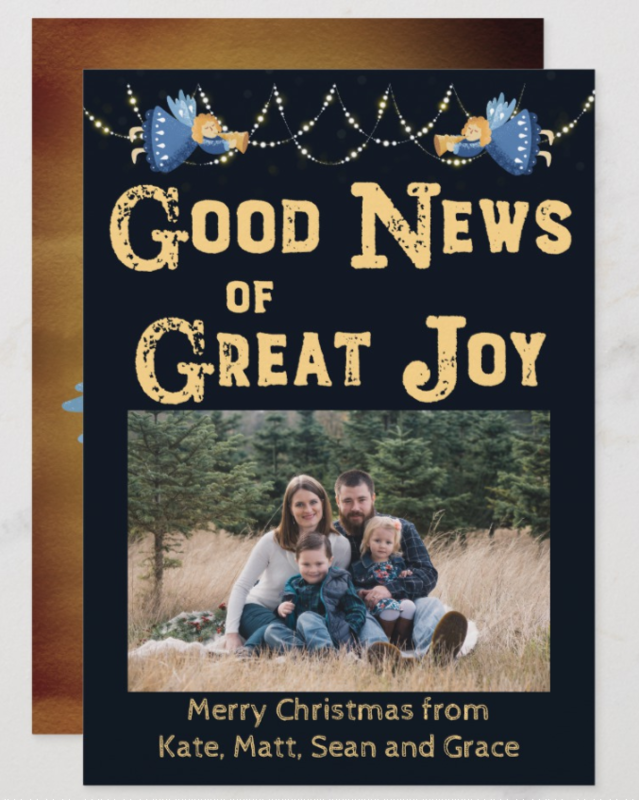 This card is cute and great for a photo of a child, but it would work with any photo that’s vertical in orientation, especially if your photo has some red colors in in. 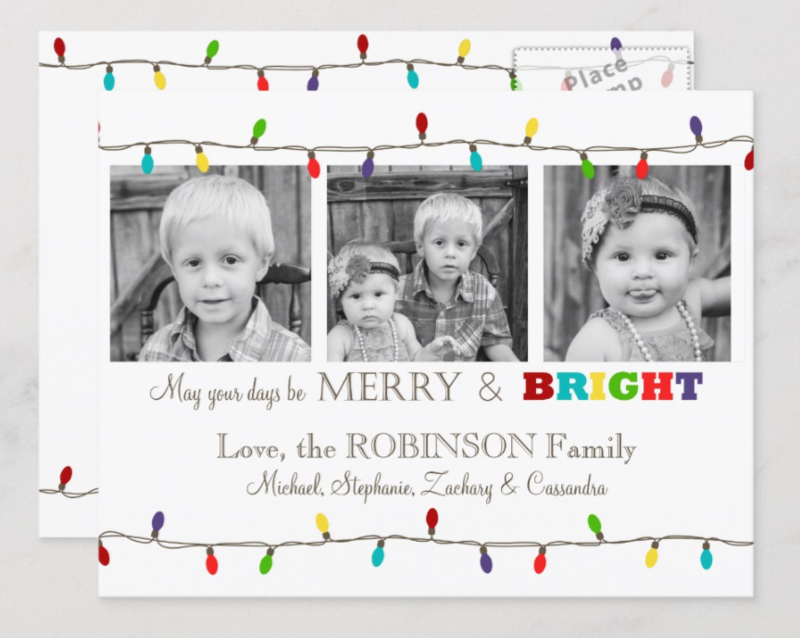 This is a great card if you have a group of several photos of your kids or pets. The kids don’t have to be fingerpainting, but it helps if the photos have bright colors. 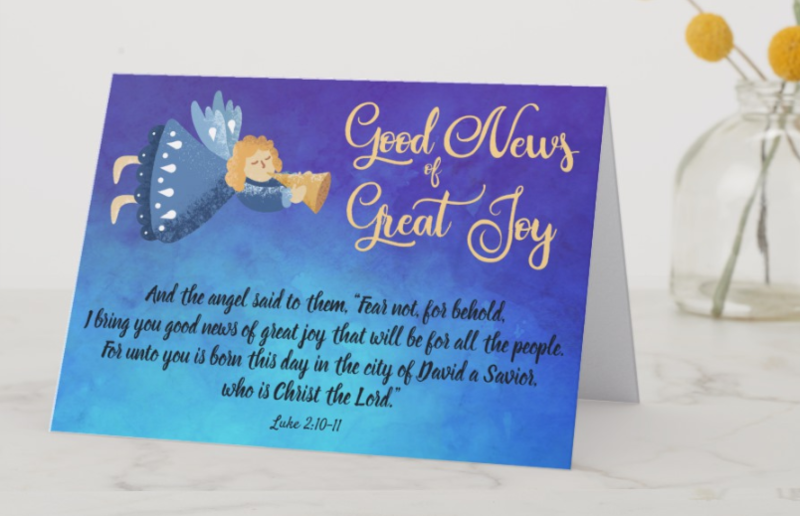 This is actually a collection of several options: there is a postcard and a traditional folded greeting card, and also a custom envelope, labels and stickers. This works well with a horizontal photo, especially if there’s some red in the picture. Click through to see all of the products in this collection. I couldn’t resist this one, though the designer intended it as a birth announcement. 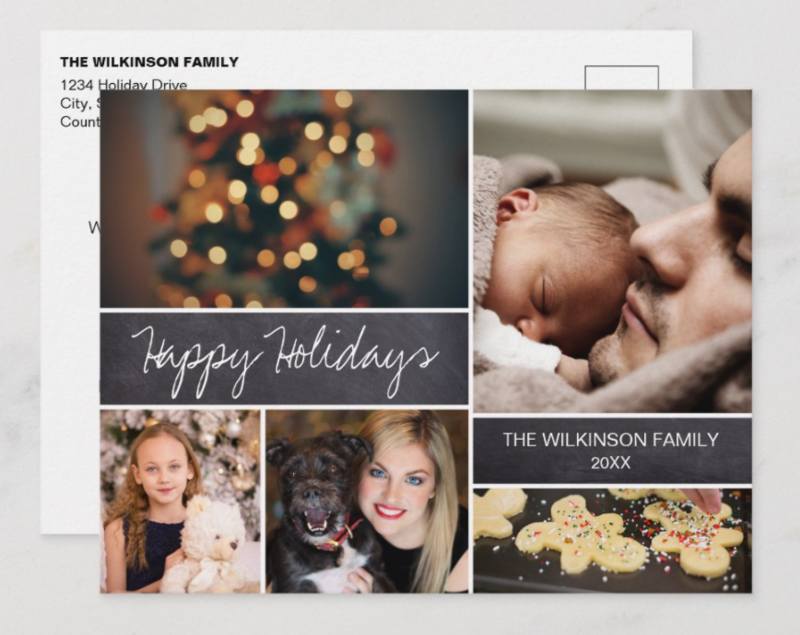 It would be great for any family who is welcoming a new bundle of joy this time of year — save time by combining the birth announcement and the Christmas card — but it would work as a Christmas card with any photo of a young child or children. 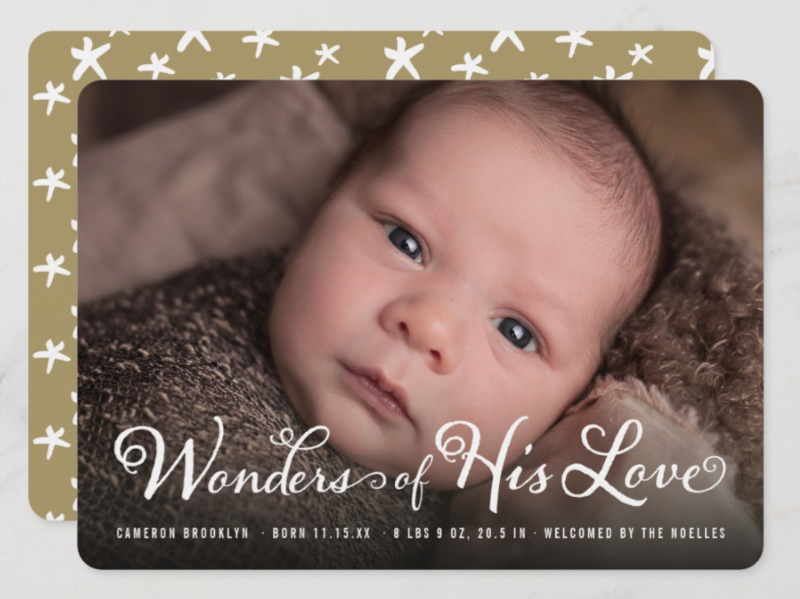 The text is customizable, so change the baby information to a personalized greeting. 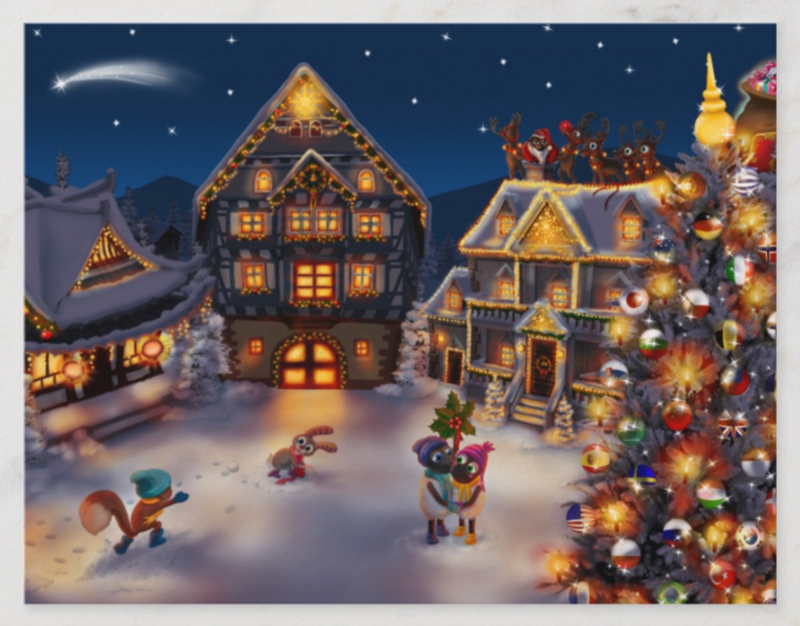 Click through to see all versions of this card, there are 3 different styles to accommodate different shaped photos. I can’t resist Sandra Boynton drawings, and here is a classic. Even people who aren’t cat lovers will smile at this whimsical drawing. 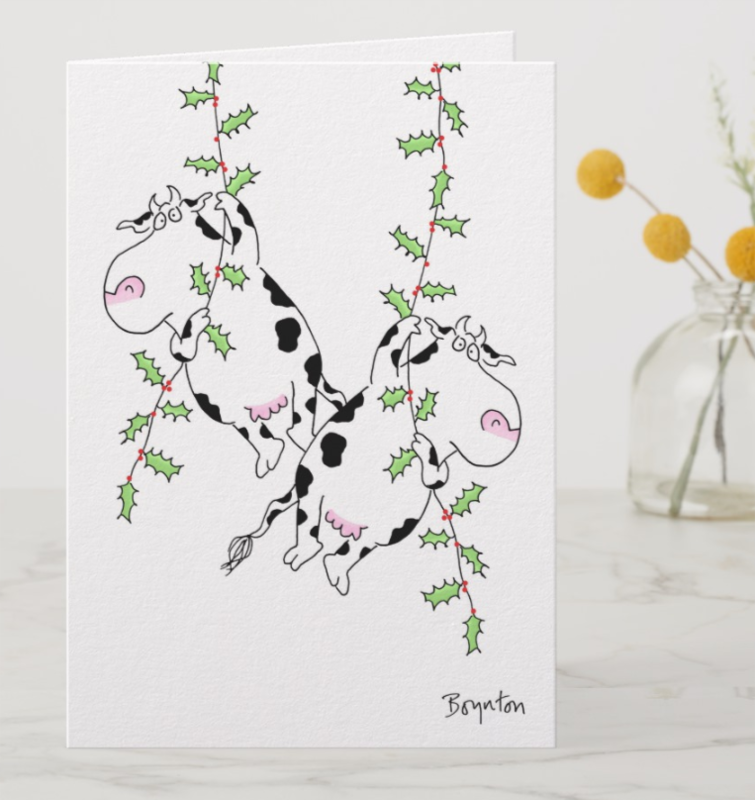 I couldn’t pick just one Sandra Boynton card, so here’s another, Deck the Halls with Cows and Holly. I think this postcard would work with any photos, though the sample pictures are black and white. 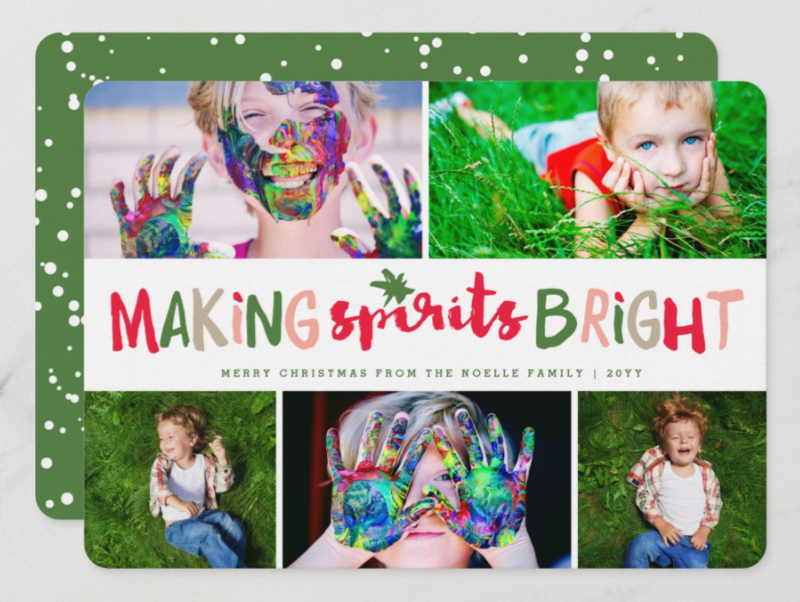 Color photos of your beautiful kids or pets or the whole family would work well, too. 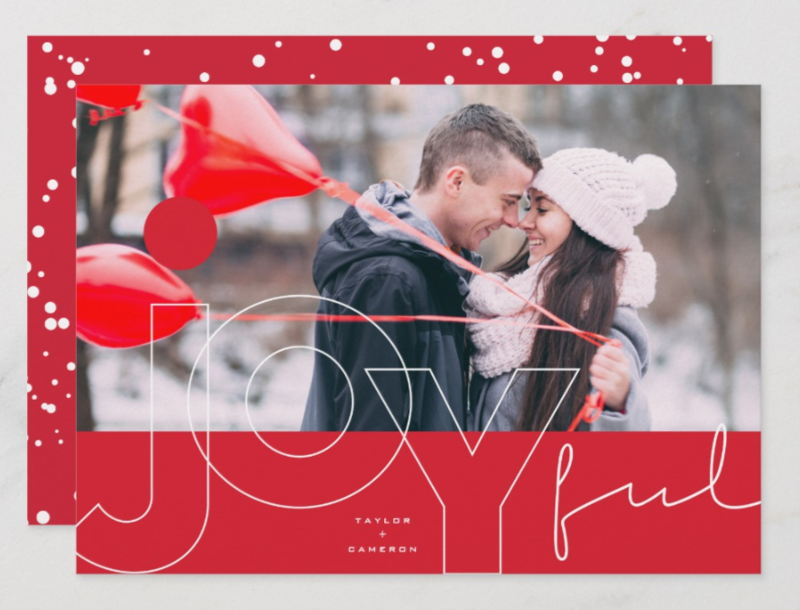 Here’s another card set up for multiple photos, and you can even leave the pictures in the upper left and lower right if you only have 3 photos. 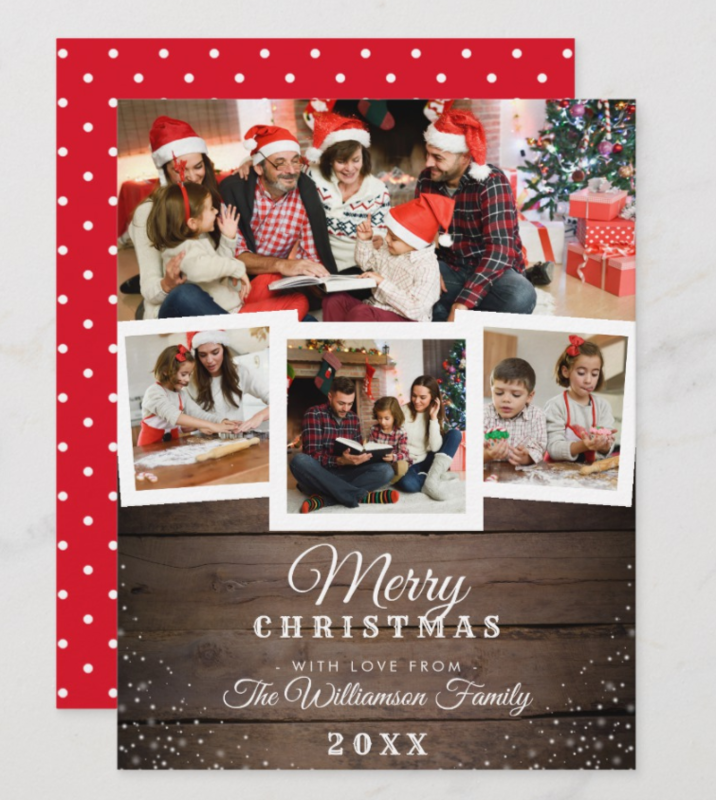 But this is a great option if you want to include a photo of your tree, your house or some holiday baking you’ve done. Here is a whole collection of photo cards, suitable for any group of 3 or 4 photos you can’t choose between. 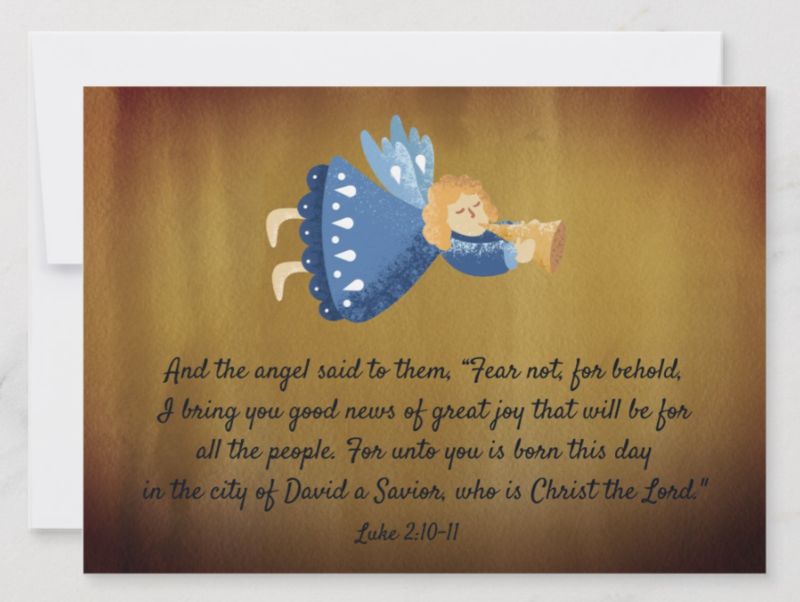 Last but not least, here’s my own design for Christmas cards. This one is a good choice if you want to use a family photo. Above is the back of the photo postcard. Most postcards have a pattern back so they can be mailed as a postcard, but I made a greeting on the back. The 5 x 7 postcard fits into an A7 envelope. See a coordinating envelope below. 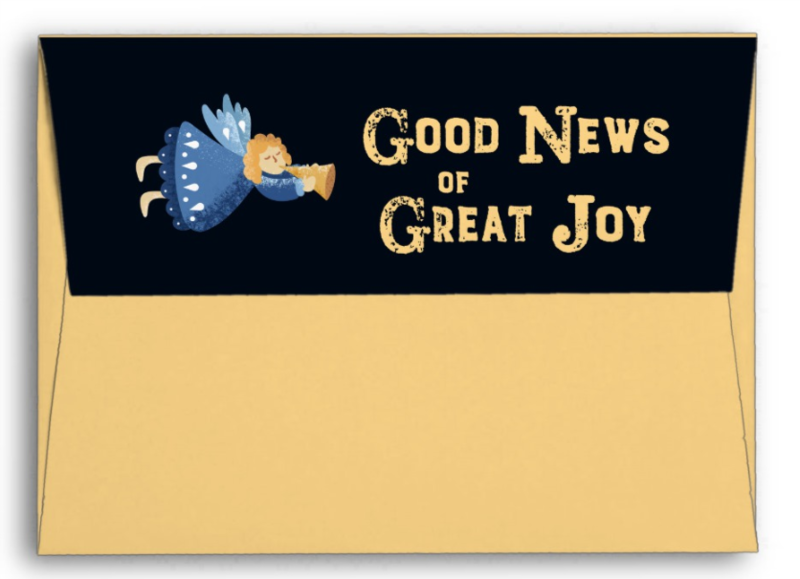 This envelop coordinates with the postcard above and the greeting card below. When you open the flap you see Christmas lights and another angel. Click on the envelope to see all the views. 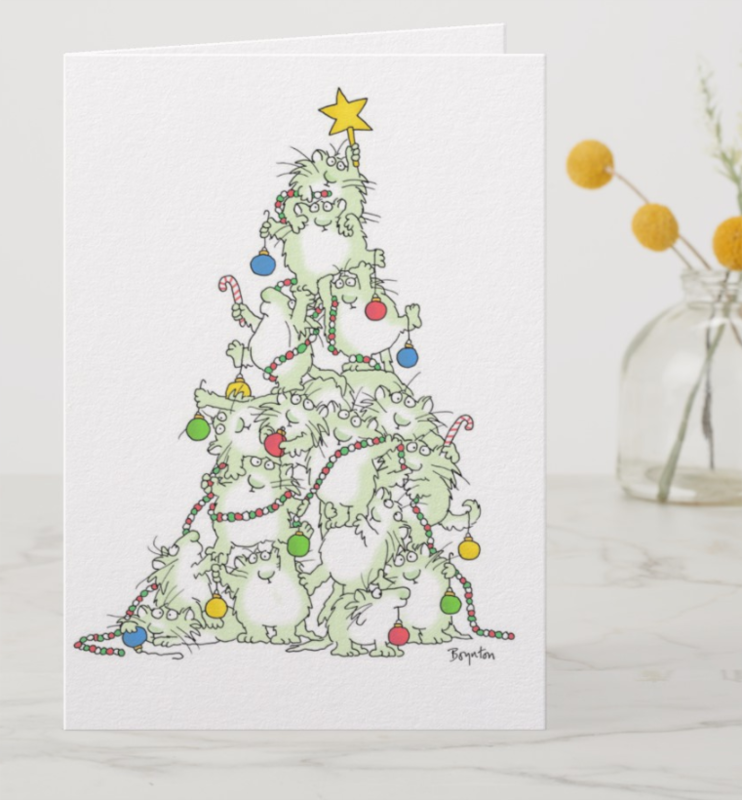 Here’s a traditional greeting card style Christmas card. The text on the inside is customizable. I’ll be adding products that coordinate with these designs. Click here and keep checking back to see more. Leave a comment below if there’s a specific product you want to see this design on.